I love Pixar films and one of my favorites was Ratatouille. I hadn’t seen it in awhile so I watched it again this weekend. I was reminded of the message in the movie “Anyone can cook”. You could say the same thing about being a vegetarian. It’s about what you want to do and then putting your mind to it. But just because anyone can doesn’t mean it is for everyone. This week I thought a lot about whether I could be a full-time vegetarian. I came to the conclusion the answer is “no”. In the same way a dish of ratatouille brought back childhood memories in the movie, there are dishes that I’ve had since I was a kid that I love and that reconnect me with my own memories. My comfort food is making a pot of chicken and noodles that my grandmother used to make for us. We live in a very all or nothing society in which we put a lot of pressure on ourselves to commit to things “110%”. While I don’t want to be a strict vegetarian, I did decide this week I want to eat vegetarian more than I normally do. I feel healthier and just lighter in general. I think it’s good to keep my weight in check. In terms of meat I also want to commit to only buying what I plan to use and buying good meat from animals well-treated. This weekend I did make a vegetarian dish that comes close to being able to replace my chicken and noodles which is saying a lot. 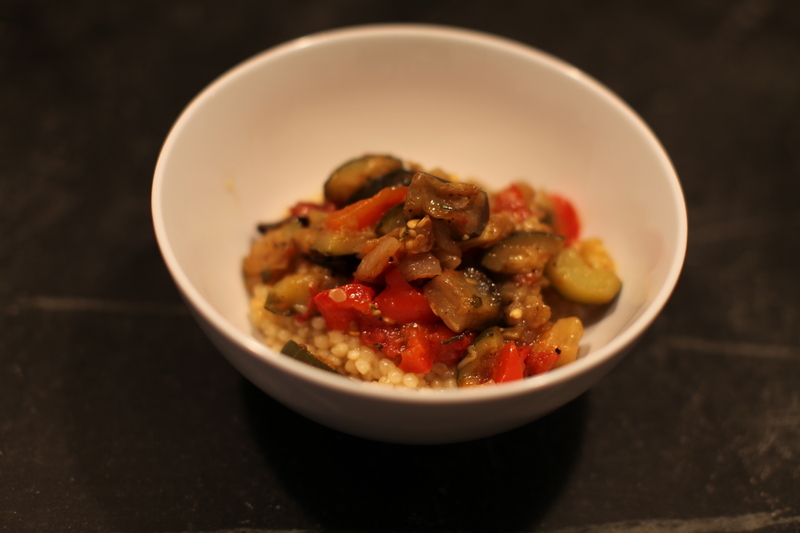 I made ratatouille from my friend Pierre’s family recipe. It was unbelievable (he is French after all) and I have a feeling when the summer veggies are in full effect it will only be even better. 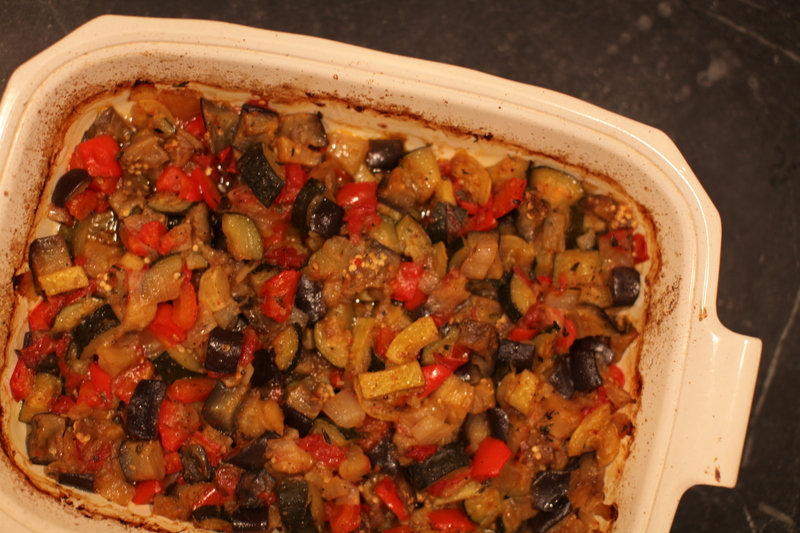 Ratatouille, when made properly, is one of the best vegetarian dishes I’ve ever had. Thanks to Pierre for sharing his family’s recipe. 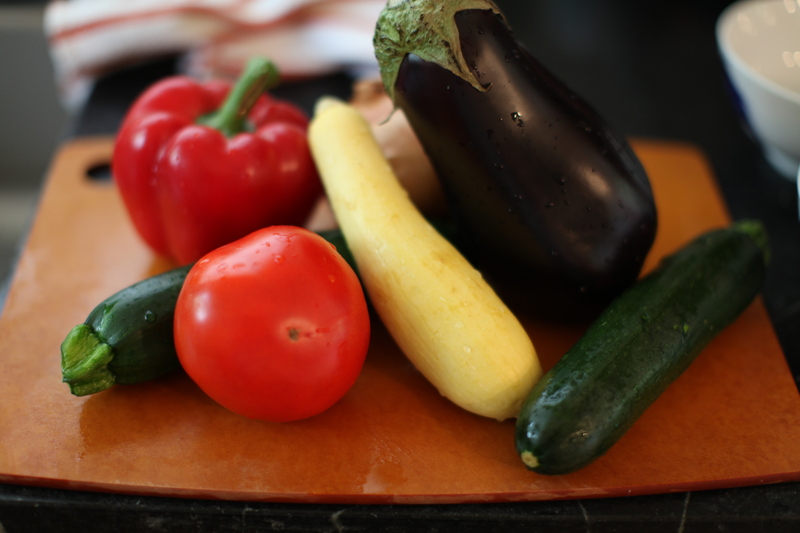 So prep is always an important step but especially for ratatouille as the vegetables will be added to the stockpot individually based on their required cooking time so its key to have them all ready and on hand to add as needed. dice vegetables in equal pieces. any where between 1/2 ” and 1″ is fine. don’t go too big so that when eating the final dish you can have more then one vegetable at a time and don’t go to small as to loose any sort of texture in your dish. so the idea here is to sautee the vegetables and then start slow cooking with the vegetable broth and develop the flavors. start by heating canola oil (cover the bottom of crock pot) on a medium to high flame (pending on your stove). not too hot so you don’t burn the onions. while the oil is heating, start boiling your vegetable broth on the side. you will need about 1 1/2 cups of broth. once the oil is ready begin with the onion. make sure to add salt as to pull all the water out and not burn them. quickly add the pepper. stir frequently until onion starts to slightly take color. add the squash and zucchini then season with salt and pepper as needed. bring heat down to medium, cover and let sit for 10 min. then add the eggplant first and a couple minutes later the tomatoes. the eggplant cooks pretty fast which is why it goes in so late and the tomatoes go in last as they add a lot of liquid which is going to stop the sautee portion of the cooking and start the slow cooking portion of the cooking process. add about one teaspoon of diced fresh thyme, season again and cover and let sit on medium for 5min. now is the part where you have to start monitoring the liquid quantity. start by adding one ladle of broth and bring heat down so its on simmer. for the next 30/45 min check every 5/10 min and add broth as the level goes down. the liquid level should always be at about lower or equal height with vegetables. should not drown the vegetables in too much liquid. once you have added all the broth, heat oven to 350 degrees. place contents of ratatouille into stoneware baker. taste and season as needed. cover with a little extra virgin olive oil and fresh diced thyme. place in the oven and let it cook in juices until they start to evaporate a little. once the juices are about at half way point in baker cover with tinfoil. let ratatouille cook for another 30min/45min until it starts to confit. remove tinfoil, bring down temperature and let cook until its looks like the vegetables are browning. if vegetables already browning then remove. remove and let sit for 15min. perfect on its own but goes very well with rice or couscous. My family and I are what I would call borderline vegetarians. Most days no animall product will pass our lips. But them we will have a hackering for some pork dumplings, or some sausage and eggs for brunch, or a burger. Eating this way suits us and, when we do eat meat/chicken/fish it is often accompanied by pleanty of vegetables. You are currently reading anyone can be vegetarian at 52 To Do.